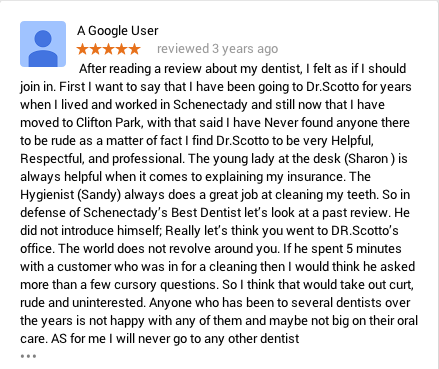 " I found Dr. Scotto because he was the only Dentist to take me right away for an emergency, and I have been coming to him for years since that day. He is very accommodating, honest, pain free and helpful to me with my dental needs and decisions. I now live in Las Vegas and fly to see him a few times a year fro dentistry. I cannot find a dentist as good. I like him and the team at the office so much! I would recommend him to anyone!" Since I was a teenager I've always had spacing on my top front teeth and given my age, I did not want to deal with traditional metal braces so I began to research other possibilities. First, I went to a consultation for Invisalign but it turns out that it was not for me. 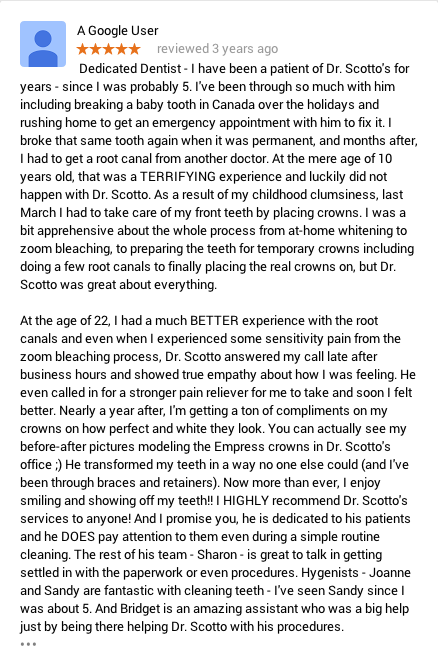 I then began reading information on veneers and found Dr. Scotto's information on the web. I set up a consultation and I have to say that from the minute I met Dr. Scotto, he was very professional, patient, does not mind if you ask a lot of questions, and takes careful time to explain every step of the process to you. 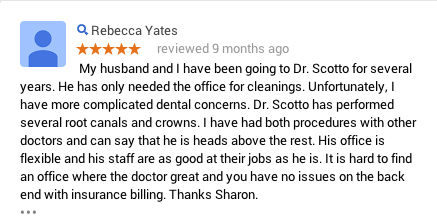 I have been extremely pleased with the results and Dr. Scotto pays attention to even the smallest details. I had 4 veneers placed on my top row of teeth and they look phenomenal. The color matches perfectly, the shape is very natural and even close family and friends could not believe how genuine and natural my smile is now. I was initially reluctant to get this procedure done, but with Dr. Scotto's attention to detail and professionalism, I could not be more happy with the results.